In honer of the fresh new face of the Drupal.org website I have decided to start writing a set of tutorials for developers that are just getting introduced to Drupal. Eventually we’ll get into some intermediate/advanced lessons using Drupal for social networking and as a content management framework. Nodes are what make Drupal the Framework that it is. Nodes are like building blocks or puzzle pieces that go together piece by piece. Each node has a type referred to as a Content Type (simply, different types of nodes). Drupal installs with two basic nodes Story and Page, and optional core modules have provisions for the following nodes: Blog entries, Forums, Comments, Polls and you can make as many custom node types as you want using a few third party modules such as Content Construction Kit , with the Views module to display CCK tools. When you add a block you must have a description, give it a title (if you don’t want a title write <none>) and add the content, either with a text editor or HTML. If your building your own block with PHP make sure PHP-mode is chosen, and enter the code between <?php ?> brackets. Menus (Administer >> Site Building >> Menu)Drupal paths (the last part of the URL such as www.example.com/?q=node/5) are important because many configuration screens in the Drupal admin area use them. 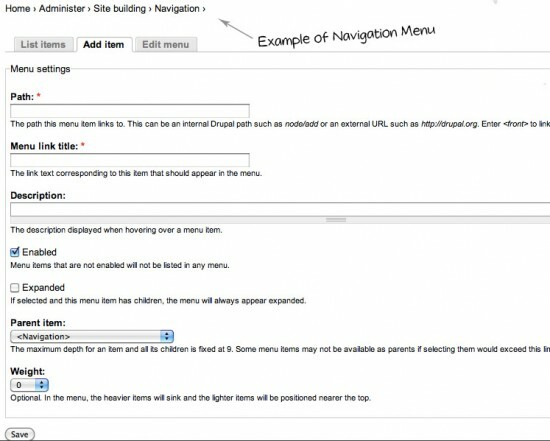 For instance, when you are adding a new item to a menu, you tell Drupal what page the menu item should point to by entering the path to the page. Menus by default include the Navigation: the main dynamic menu for the site, usually for registered user and not anonymous. Primary (main menu) and Secondary Links. Modules (Administer >> Site Building >> Modules) provide more functionality for your site. There are Core modules that are already installed that Drupal needs to run and there are some optional modules that come packaged with Drupal that might be useful to some, but not necessarily needed for all websites. there are lots of useful third party modules for everything you might need such as Content Construction Kit , and Views, but for simpler tasks you might want to try these: Webform (great for a contact form), IMCE (image uploading) and WYSIWYG (text editing). You will also notice that some modules depend or require other modules to work properly. That should give you a start. 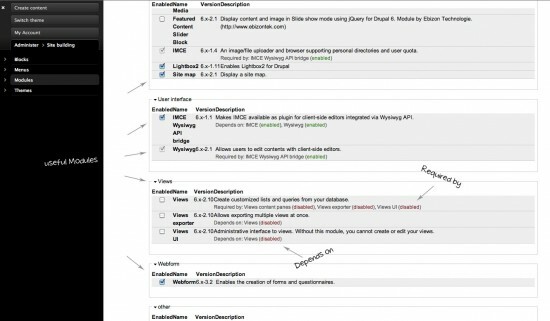 I will be elaborating on all of these areas as well as many other features within Drupal and all of the great things that can be accomplished with this Framework. Hope this was of some use.